Corkscrew Peak is an impressive mountain located in the Grapevine Range of Death Valley National Park. It’s a great desert peak not far from the Nevada border. This is one of those mountains that grabs your attention and beckons you to climb. The odd shaped summit block is very distinctive and visible from the valley floor. As such it sees its fair share of climbers. Because of the popularity, there is a pretty well established trail leading the summit. The only real routefinding challenge is finding the trail at the start of the hike from the highway. After a nice climb of Thimble Peak in the morning, I was ready for the main objective of the day. It was about 12:30 when I started the hike from the Corkscrew Peak sign on the side of the highway. I’d heard there was a well-worn trail, but at the highway there was no sign of it. I knew I needed to go west for a bit, and after a quarter mile or so, I spotted some footprints in the sand in an indistinct wash. I followed the footprints for a while, and gradually the trail got more noticeable and was marked with occasional cairns. The terrain at the start of the hike was very cool, with a bunch of interesting plant life, several fast moving lizards, and even a Costa’s Hummingbird sighting. To top it off, there were a ton of wildflowers in bloom, part of Death Valley’s 2016 “Super Bloom”. I continued up the wash until I reached a heavily cairned left-hand turn that briefly took me up a tighter side wash, and then up onto a low ridge. From the ridge, I could now see much of the route ahead of me. It was sunny but temps were mild and no more than 60 degrees. I continued up the ridge on the sometimes steep, but always easy to follow trail, enjoying the views and the abundant cactus and flowers. Once at the “hole in the rock” I knew the summit was near, and it wasn’t long before I was standing on top, two and a half hours after leaving the trailhead. Form the highpoint, I had a great view of Thimble Peak, which I’d climbed earlier in the day. And behind me were expansive views of Death Valley. With all of the day’s objectives now taken care of, I took the opportunity to enjoy an extended visit perched on the summit soaking in the sun. (We Idaho guys don’t often get to sit on a mountaintop in March in shorts and a t-shirt.) After reading the many summit register entries, and taking a bunch of photos, it was time to head down. Corkscrew Peak was a great climb. It took me 4.5 hours round trip to cover just over 7 miles and 3100’ of elevation gain. Next up was a quick shower at Furnace Creek, and then the drive back to Las Vegas for a tradeshow the next day. 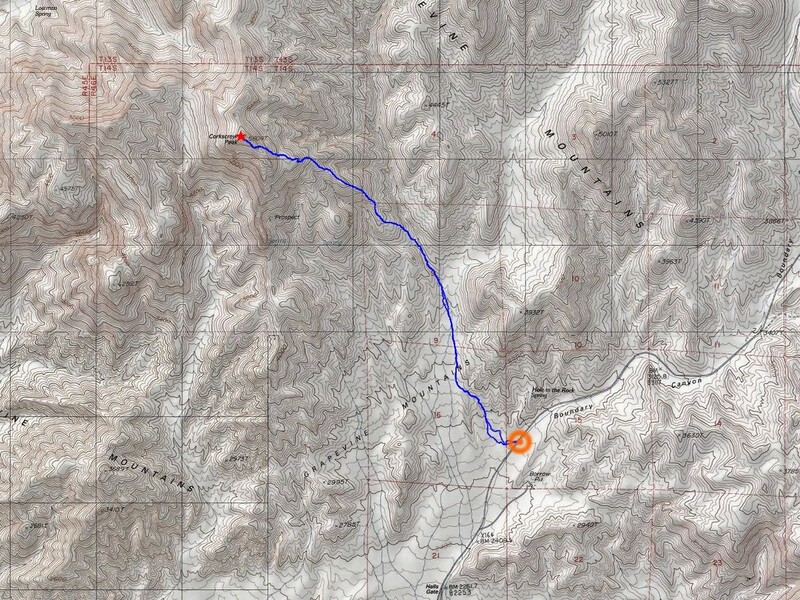 Map of the route, just over 7 miles and 3100' elevation gain. Corkscrew Peak from the start of the hike at the highway. Lots of these cactus plants along the way. Prickly Pear Cactus in bloom. The trail is easy to follow once you find it. Approach hike with Corkscrew Peak in the distance. Follow the cairns up this well marked side wash. The trail follows the ridge after leaving the wash.
Hole in the rock, not far from the summit. Me on the summit of Corkscrew Peak, with Thimble Peak in the background. Death Valley from the summit of Corkscrew Peak. Corkscrew Peak summit register, with the Thimble Peak and the Grapevine Mountains to the north. On the way back down, still a long way back to the car. Hiking down the wash trail amidst the "super bloom" of 2016.